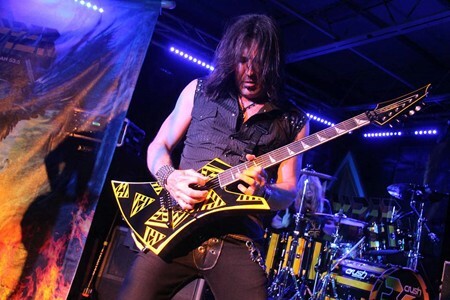 After Stryper‘s amazing performance at the Rockpile West last year — which was unexpected to me at the time (read that review here) — my expectations this time around were very high! 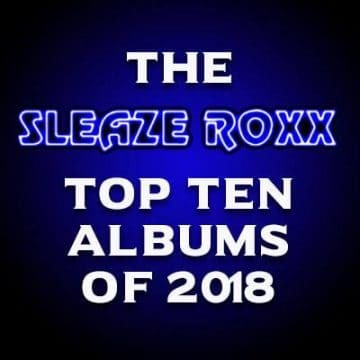 To put even more pressure on Stryper going into the show, I had just witnessed what I considered to be my favorite concert of the year ten days earlier when I saw Steel Panther rock the Sound Academy. 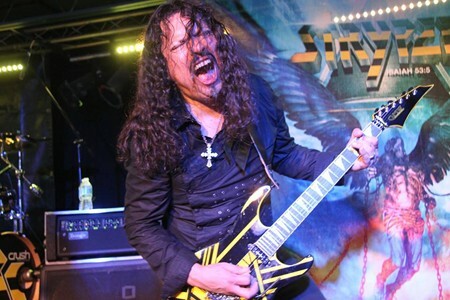 Accordingly, Stryper had a lot to live up to, but I knew that if there was one band that could meet or even exceed expectations it had to be Stryper — for reasons including that the band definitely has some divine backing with everything that it does. Given that last year’s show was completely packed with people, and although I was expecting slightly less attendees this time around since Stryper was playing back to back shows in Toronto, I thought that it would be wise to show up early to be able to secure a good spot near the stage. I arrived at around 9 pm and for the first time was at the Rockpile West before the sun had even gone down. I was a tad disappointed with the opening bands — Insites and Second Pass — that were listed to play this time around simply because I was not familiar with either of them. 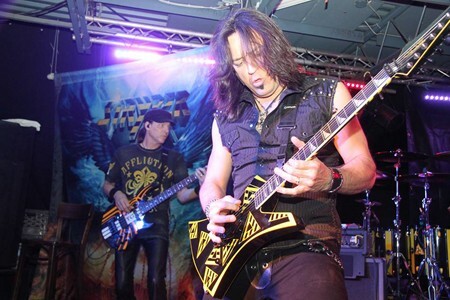 Stryper was originally scheduled to play two shows in Toronto in April but cancelled those dates and rescheduled them (thank you) to June 5th and 6th, for whatever reasons. If my memory serves correctly, J’Nai was supposed to open on the first night in April while Revolution was slated to open on the second night. I would have loved seeing either of those bands again, and although Revolution was still scheduled to open on the second show I was going to be out of town on that night. 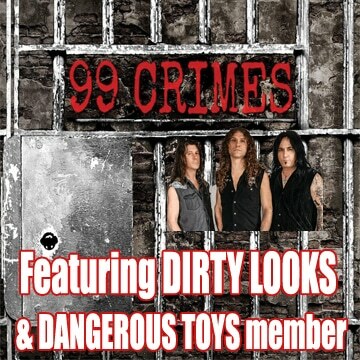 The first band that I saw was Insites, who I was surprised to hear came from Miami, Florida. Although the band plays a somewhat more subdued brand of hard rock than I usually listen to, the group quickly won me over — and I think the rest of the audience as well. 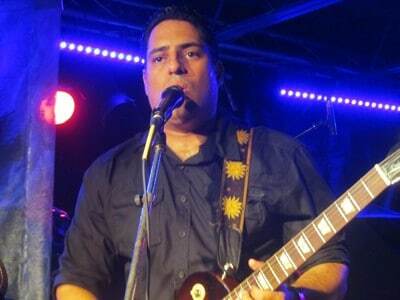 Insites‘ lead guitarist, Jose Rodriguez-Schmidt, had a style of playing somewhat similar to U2‘s Edge. With his look, lead singer and guitarist James Gamboa reminded me of a shorter and older version of Lou Diamond Phillips in the 1987 movie ‘La Bamba’. 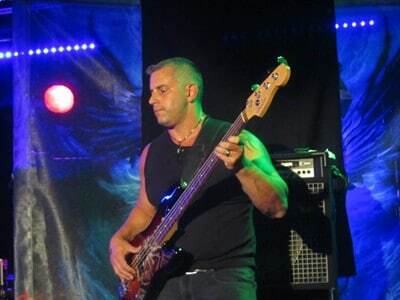 Bassist Joseph Kuchta had some massive arms and a chest that strongly suggested that the man had been a work-out machine at some point in his life. All three of them looked relaxed out there and early on exchanged some laughs on stage. For instance, Gamboa indicated that he would try something different by using a harmonica on one song and Rodriguez-Schmidt quickly asked whether he had even brought his harmonica, to which the frontman replied with a smile — as he took a harmonica out of his front shirt pocket — that he sometimes forgets it. On another instance, the members of Insites made some inevitable comparisons between the ‘cold’ weather in Toronto and the hot weather in Florida that had apparently recently reached 90 degrees Fahrenheit. I’m not exactly sure what brought Insites all the way from Miami to open one of Stryper‘s Toronto shows, but I am glad that they did on this night! 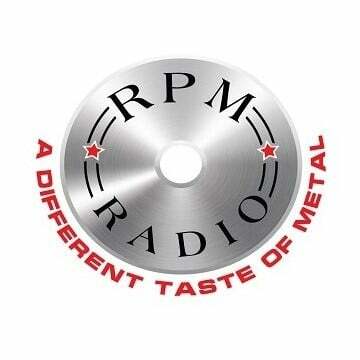 They sounded quite professional in that their sound was well refined and the band gelled well together. It was therefore no surprise when Gamboa announced that the band was working on a third record together. I, of course, preferred the faster paced songs that they had to offer but even their slower songs, “Broken” and “Wait”, were pretty good. Insites closed their set with the excellent “Made Of Glass” — I could definitely see this band getting lots of radio airplay. A Stryper concert always feels different than any other hard rock and heavy metal show that I attend simply because the audience is not comprised of the usual metal crowd but rather a more diverse fanbase including some Christians who may like hard rock music but only really attend Stryper concerts. One difference is the atmosphere. For instance, out of all the concerts that I have attended in the last year, the two friendliest crowds — where strangers became friends — happened to be the ones at Stryper‘s two Rockpile West shows. It was therefore not surprising to run into my Facebook friend Rob Ellis whom I had first met, but not seen since the last Stryper show, at the Rockpile West back in July 2013. 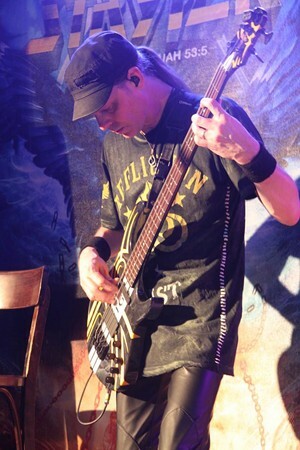 As Rob pointed out, he attends lots of concerts but most are in church settings and the only real “bar” band — I prefer “arena” band — that he goes to see is Stryper. 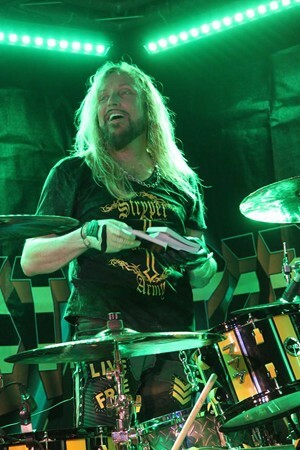 This time around, Rob was armed with a massive camera and his big smile was likely a result of having just met the Stryper band members at their meet and greet session earlier that evening. I had already secured a great spot at the front of the stage by the time that Rob and I reconnected and he was able to join me right at the front of the stage. Is there really a better spot to be at a concert? No need to say that the photos for this review from this point forward were going to get a very big upgrade. Thank you for the great photos Rob! I thought that Second Pass was still to play given that it was only about 10:00 pm when Insites‘ set finished, but I was not heartbroken to hear from Rob that they had already played earlier on and Stryper was next! The wait was a little longer than I expected as Stryper only hit the stage at around 11:00 pm. Unlike the previous year, Stryper‘s stage set fit the Rockpile West’s unconventional triangle shaped stage a lot better. For instance, last year, Robert Sweet‘s drum set was literally hidden by stacks of Marshall amps. 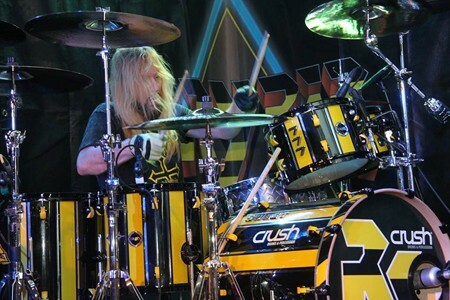 This time around, his yellow and black striped kit was very visible and it was the first time that I realized he places his drum set sort of sideways to the audience. As the Stryper stage was slowly getting finalized — complete with yellow and black duct tape — I was surprised to see how many songs that the band was going to play from the posted set list on the stage! Twenty songs — not since having seen KISS play live had I seen a band perform so many songs in one concert. Stryper hit the stage with “God” — their lone original song from their covers CD ‘The Covering’. Given the wails that frontman Michael Sweet had to sing in order to get through the song, there was no doubt that the lead singer’s voice was in fine form right from the opening song. Next up was “Revelation”, from their latest album ‘No More Hell To Pay’, which sounded really good live and better than on the new record. From there, it was a trip down memory lane as the band tore through some older classics including “Loud And Clear”, “Calling On You”, and one of my personal favorites “More Than A Man”. I am not sure whether this is one of Stryper‘s “scripted” parts of the show, but partway through “Loud and Clear” the band stopped playing and Michael Sweet commented that the audience had forgotten how to sing the song! After reminding the fans in attendance that this was a ‘repeat after me’ type chorus, the band and audience seemed to be in better sync with fists pumping from the crowd during its designated sing along portions. Whether it was scripted or not, it was a shrewd move on the band’s part to engage the audience in more participation early on in the show. 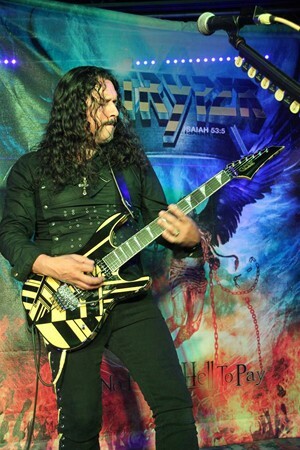 Other new songs that were played from Stryper‘s latest CD included the title track and “Marching Into Battle”. Unfortunately, that would be the end of what was performed from the new record. I would have loved to hear “Legacy”, “Jesus Is Just Alright” and/or “Water Into Wine”, but that was not meant to be. Throughout the show, you could see Michael Sweet gesturing to someone hidden off stage about fine-tuning the volume of his guitar, etc. 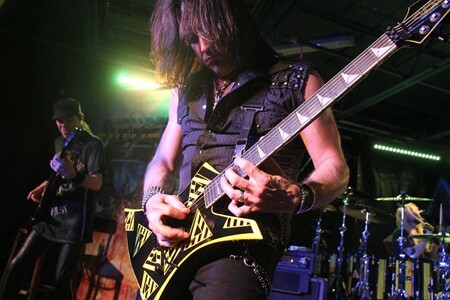 Whether the frontman (who describes himself as a perfectionist in his excellent biography ‘Honestly’) was satisfied or not with Stryper‘s sound during the evening, I thought that they sounded really good — from the guitar melodies all the way to the vocal harmonies. The latter was certainly on strong display during Stryper‘s first cover of the night — Kansas‘ “Carry On Wayward Son”, which was one of my favorite songs played during the evening. The other cover song performed was KISS‘ “Shout It Out Loud” — which just like at the M3 Rock Festival (read that review here) — sounded really good and better, or at least fresher to my ears, than KISS‘ version. From then on, the band dug into their vaults to revisit some lesser known songs that had likely not been played in a while including “In God We Trust”, one of my favorites from the band back in the ’80s, “Always There For You”, and one I was not that familiar with, “Caught In The Middle”. 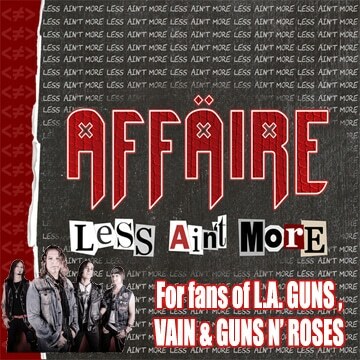 The inclusion of those songs was probably the reason why more songs from ‘No More Hell To Pay’ weren’t added to the set. I can’t remember when Robert Sweet‘s turn came to toss some Bibles into the crowd, but to my great surprise one landed on the stage near me and you can likely imagine just how fast I scooped it up — so fast in fact that it felt like I was the only one who reached out for it. Anyways, it was a very cool souvenir to take home and certainly a big incentive to read and study God’s words. It seemed that most of the band members were quite, unknowingly, generous to me on this night as I also caught and picked up an Oz Fox guitar pick (donated to my friend Rob) and a Timothy Gaines bass pick. 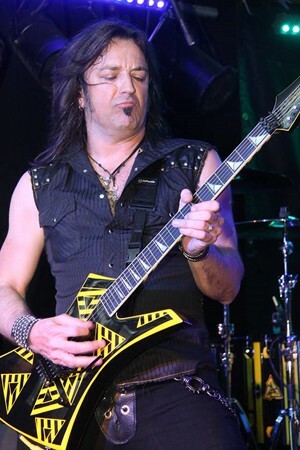 With a set list of about twenty songs, it was no surprise that Stryper‘s biggest hit — the keyboard laced “Honestly” — was played. Certainly not one of my favorites, but I can totally understand why the band chose to perform the hit single. Stryper closed out their set with three of my favorites, the fast paced “The Way” (the first Stryper song I ever heard), “Soldiers Under Command”, and the band’s signature track “To Hell With The Devil”. Given that I, and likely many others, had seen the posted set list on the stage throughout the night, I was a bit disappointed when the band did not return to play “Legacy”. However, after thinking about it, it is very hard to complain when a band has given its all, put on a fantastic performance, and played twenty — yes twenty — songs, if you include the intro “Abyss”. 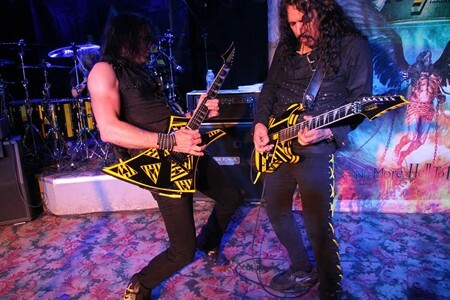 Once again, Stryper put on one amazing live performance and I can’t wait to see them play live again.